I am absolutely crazy about black beans. I've had black bean burgers at restaurants before, and once GB even made a black bean burger at home. The recipe he used was a little wonky, so I did some sleuthing on The Food Network website and found a great recipe from Sandra Lee. I chopped the garlic and onion crudely. Next, I busted out the Ninja to do the rest of the work. 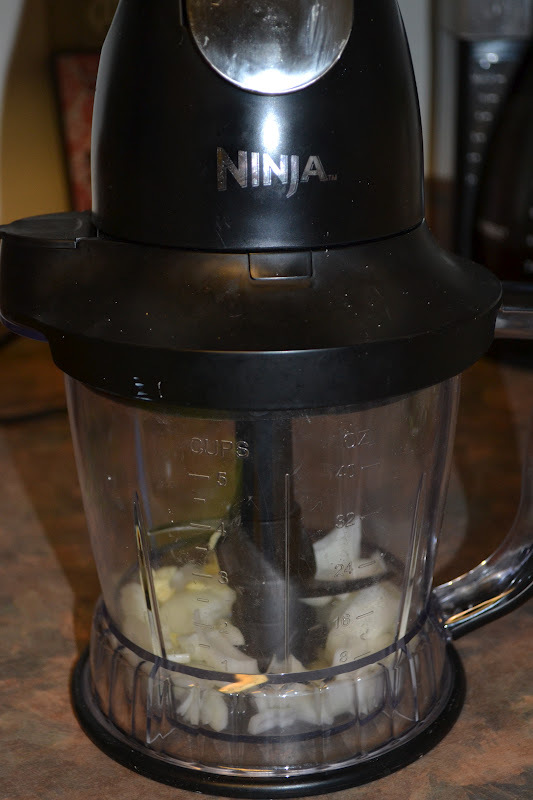 I used the Ninja to finely chop up the onion and garlic. Next I drained the first can of black beans. I then rinsed the black beans. I added cilantro and parsley to the ninja followed by the black beans, chili flakes, and one egg. In a large bowl I combined the other can of black beans (drained and rinsed) with 1/2 cup of bread crumbs. I combined those ingredients with the pureed beans and veggies. It turned into a cookie dough texture. After reading the comments of this recipe on The Food Network website, I took someones advice and put the mixture in the fridge for about 20 minutes to increase firmness. The black bean burgers were extremely fragile. I was sure they would crumble once placed in an oiled pan. But they didn't! Flipping the burgers was a little sketchy, but somehow I was able to keep them together. Time to gather the toppings. I have been so sick of our lettuce going bad quickly, like below. Following the advice of my good friend B, I bought live lettuce instead. It's definitely more expensive, but because the root is in tact, the lettuce lasts twice as long as a head of lettuce. I added muenster cheese to my black bean burger. So, are you wondering how they tasted? Incredible!!! GB was so impressed with my cooking skill. I was impressed with myself too, which is rare. I would definitely recommend this recipe. However next time, I would only puree 1/2 can of beans to have a chunkier burger patty. Let me know if you give this recipe a try! I'll gladly make you one!